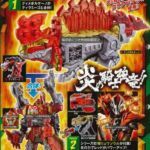 Tokunation › Super Sentai › Kishiryu Sentai RyuSoulger Q2 Catalog Images Released- Introducing Ryusoul Gold & DimeVolcano! 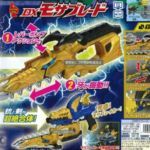 Kishiryu Sentai RyuSoulger Q2 Catalog Images Released- Introducing Ryusoul Gold & DimeVolcano! After some early listings, we now have our first images from the second quarter of Kishiryu Sentai RyuSoulger! This is our first look at the 43rd Super Sentai’s SIXTH Ranger, Ryusoul Gold! 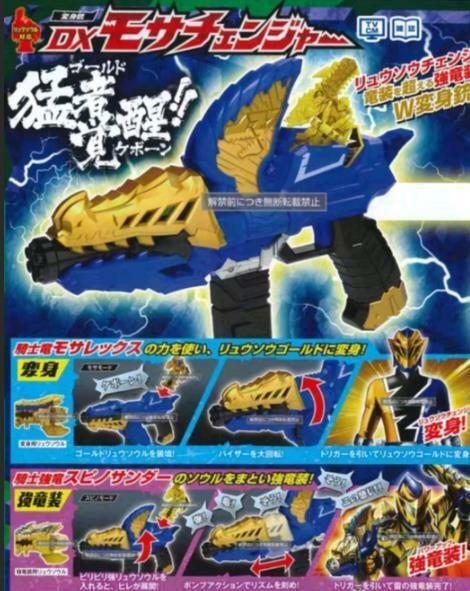 This RyuSoulger has a gold base costume but with navy blue highlights instead of the silver seen on the core five. His personal Kishiryu is a Mosasaurus. 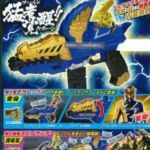 Ryusoul Gold’s unique henshin device is the Mosa Changer– a gun that is powered by the Ryusouls. His signature weapon is known as the Mosa Blade which can combine with the Changer for more powerful attacks. But Gold isn’t the only newcomer in these scans! A new Kishiryu has been revealed- DimeVolcano! 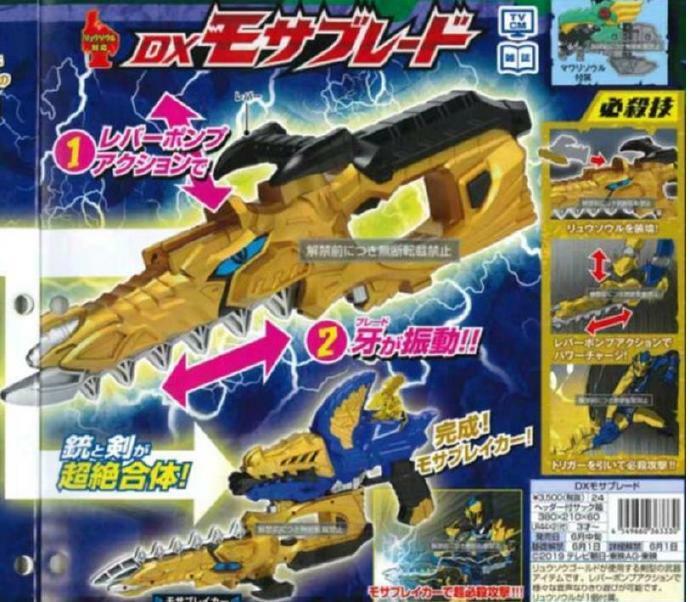 This Dimetrodon based Mecha is able to combine with KishiRyuOh and increase its firepower. 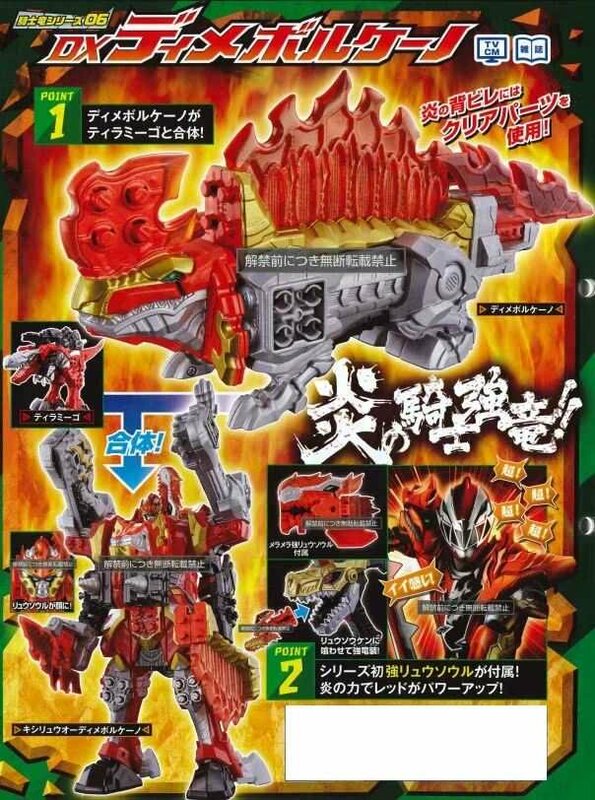 DimeVolcano also brings a unique Ryusoul- the MeraMera Cho RyuSoul– that gives the Ryusoulgers special upgrade armor. Definitely some exciting things on the horizon for the 43rd Super Sentai Series! Stay tuned to TokuNation for all Kishiryu Sentai RyuSoulger reveals!